THE SKINNY: This was called a "cult French moisturizer" when it came in a beauty box a few months ago. The lotion is thick and creamy and feels nice on the skin. Because it's so think, I've been using it at night cream. This lotion is made with collagen, elastin and Vitamins A, E and F. It's all designed to improve skin tone and soften fine lines and wrinkles. The bad thing? My skin does feel soft after I use it, but after a few weeks, it doesn't really look any different. KEEP OR TOSS: Toss. I really want to love it because of the advertising, but it doesn't do anything for me. 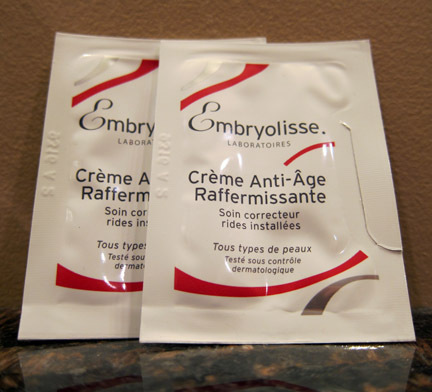 CHECK IT OUT: Embryolisse offers a full line of anti-aging products.